The tornado was part of a storm system that injured dozens across Texas and the southern U.S. The storm that injured over a dozen and damaged several buildings in Franklin on Saturday produced a tornado that left a 32.6-mile long trail of damage over a span of 55 minutes, the National Weather Service said Monday. The tornado formed just west of the Brazos River in Milam County and moved across State Highway 6, about four miles north of Hearne, according to the National Weather Service's report. At that point in the storm's development, the NWS classified it as an EF-1 tornado. 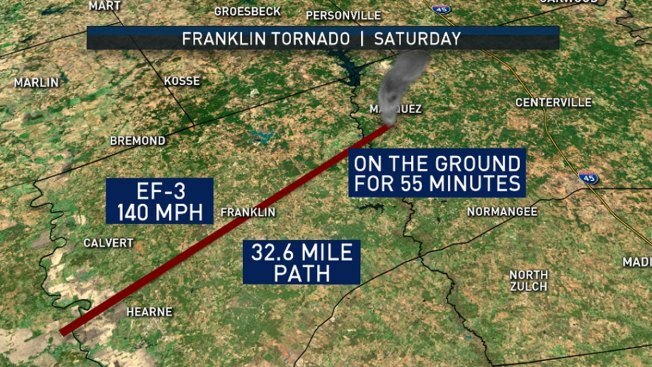 The most significant damage was in Franklin, a small town in Robertson County, where the NWS concluded the tornado reached the strength of an EF-3 storm. Wind speeds peaked at an estimated 140 mph. Two people were hospitalized Saturday for injuries not thought to be life-threatening, while others were treated at the scene for minor injuries, Robertson County Sheriff Gerald Yezak told the Associated Press. Some people had to be extricated from their homes. From there, the storm moved to the east-northeast into Leon County, where it decreased in strength. The NWS said damage at the tail end of the story was consistent with the intensity of an EF-0 tornado.